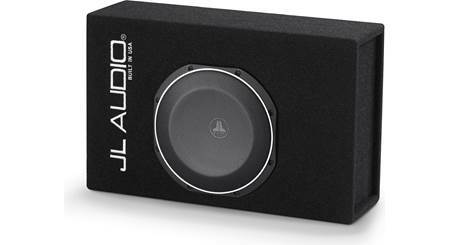 JL Audio's CS110LG-TW1-2 enclosed subwoofer system delivers impressive bass from an enclosure that's designed for maximum impact. 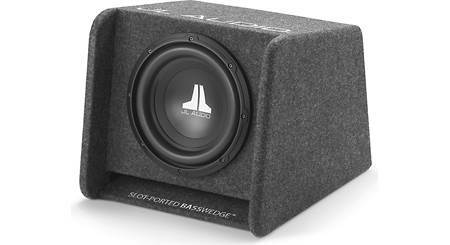 This PowerWedge sub handles up to 300 watts RMS, housing a single 10" 10TW1-2 subwoofer that offers serious low end. The enclosure is designed from the ground up to get optimum performance from its driver, so you get much more than just a box with a speaker inside. 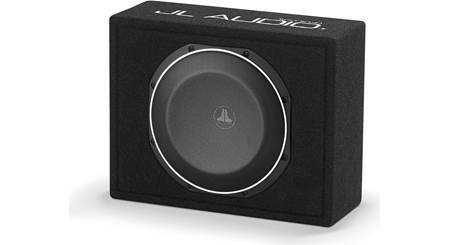 And JL Audio designed the TW1-2 speakers specifically for compact enclosures, so you know it'll deliver maximum performance. JL Audio uses state-of-the-art automated woodworking equipment to fabricate the high-quality MDF enclosure with rugged automotive carpeting, a steel-mesh grille, 5-way binding posts, and solid internal wiring. 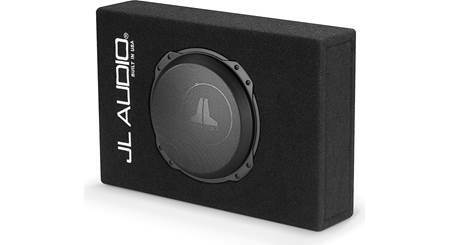 The enclosure is built and inspected by hand at the manufacturing facility in Florida to ensure that you get the bass that you expect from JL Audio. 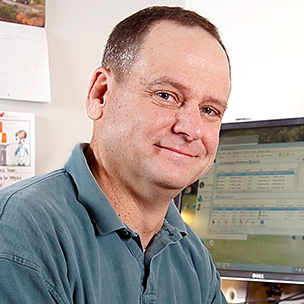 The specially designed enclosure measures less than 6 inches deep, so it'll fit a lot of tight spaces. Its sealed construction and TW1-2 driver keeps your bass rich and clear. You'll enjoy deep low-frequency response from all of your music with this capable enclosure in your vehicle. Overview: The CS110LG-TW1-2 PowerWedge subwoofer system is a compact bass solution for vehicles with limited space. 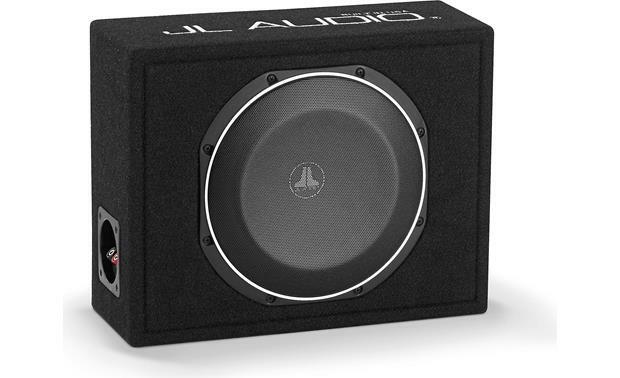 This sealed enclosure is loaded with one 10TW1-2 2Ω subwoofer. Enclosure Design: The enclosure features top-quality MDF (medium-density fiberboard), constructed using state-of-the-art CNC woodworking equipment, and covered with high-grade automotive carpeting. The driver is protected by a black steel-mesh grille. One pair of 5-way binding posts is on the left side of the enclosure. 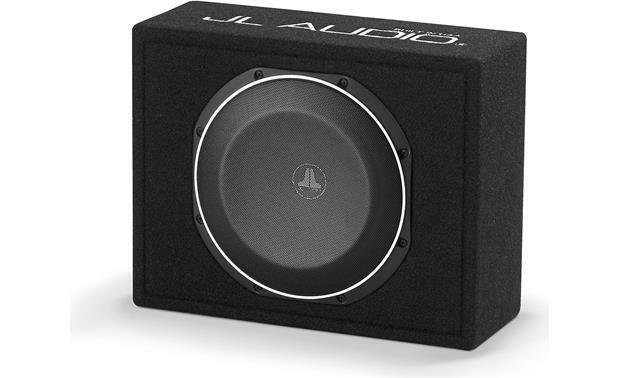 Searches related to the JL Audio CS110LG-TW1-2 PowerWedge 10" sealed subwoofer enclosure.